how is this bridge any different from the overpass that is there now? More lanes over and under. More elevated, on/off ramps reconfigured, and wider/more lanes. Ask a question get an answer, I love this board. Because what wealthy sophisticated international buyer doesn’t want a massive highway running through the center of the city? The best way to understand is to stand on the seawall under 395 and walk west along 395 until you get to I95. It will become strikingly clear, that I395 is a road built on a long pile of dirt. A suspension bridge will free up all the land ynderneath (many acres) AND will improve the safety, AND improve the efficiency of the traffic flow. Once understood, this project is a no-brainer. Sadly, very people are interested in understanding. This is where the homeless guy got his face eaten off by some schmuck. Once the suspension bridge is completed, there won’t be these little hiding places, and the walk from the Museums to the Performing Arts Center will be pleasant instead of its current state of “near impossible” and dangerous. The land underneath will be as worthless and unused as the land underneath I95 at the Miami River. No one wants to hang out underneath a roaring highway. I just like the look of it because it adds to the amazing growing skyline. But I don’t see the purpose of this, I would spend this money instead in expanding the metromover to cover more areas in Miami and The beach. Are you going to pay for it, or complain when they start charging fares? I’d be happy to leave the car home and pay for the metromover if it takes me everywhere. Absolutely. If you don’t understand. Learn. Get educated. Ask someone who knows. There are about a dozen or more people on this board that don’t understand, and don’t seek to gain understanding. There is no choice of; fixing this bridge OR adding more trains. This bridge repair/reconfiguration is expense and necessary. The aesthetic part that makes this a “signature bridge” is adding about 10% or less to the cost of the project. The rest of it will add strength and safety. While billions of dollars of cargo travels on this stretch of I-395 along with hundreds of thousands of people, I have never seen an ambulance, firetruck, or cargo container travel on the Metrorail. (get it? They are different things. They are paid from different sources.) Get educated, you will be glad you did. Signature bridge? How about a signature transportation system! Great website. Seems like they buried the lead. The best part of it is the Interactive map that shows the Fountain, Amphitheater, bike path, pedestrian trail, and art work going UNDER the signature bridge. A massive improvement over the mound of dirt that is currently UNDER I-395. Reminds me of the I-93 Bunker Hill Bridge in Downtown Boston. How to force the FDOT to invest in mass transportation? Option one: force them to live in Miami without covered car expenses. Option two: to fire the whole department and hire new people from large cities with reliable mass transportation system. There is a” Scorpion” tower just down the road,would a six legged “Tarantula” bridge make sense? This is a bait and switch. MDX never conducted a public hearing on this so call ” Double Decker”. The original plans called for them to widen the existing lanes not build another highway on top. No other city in the country is building a new elevated highway through the center of their city; they are tearing them down or burying them. But Miami is, and it will even be a double decker highway to really increase the “wall” effect and maximize the destruction of the urban fabric. The idea that raising the elevated highway even higher than the existing one will make the land beneath more valuable is ridiculous. 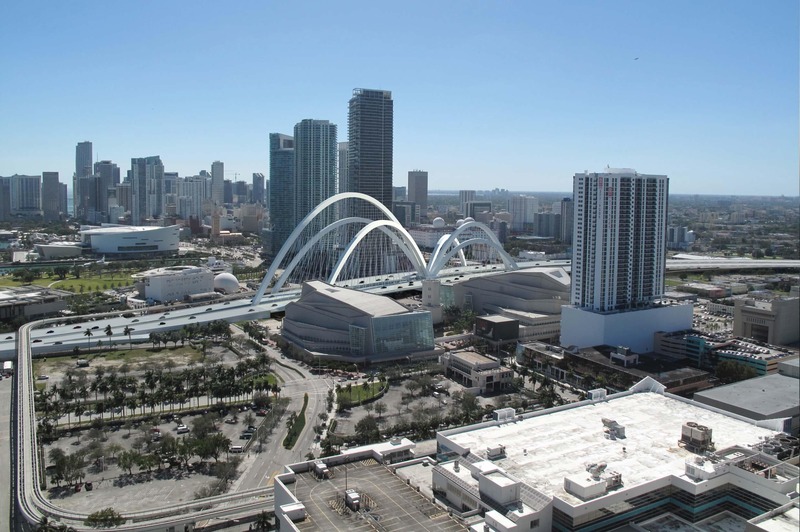 The I95 bridge over the Miami River is far higher than this will be and the WATERFRONT land below it remains almost worthless after decades. It’s never been used for anything but parking or car storage despite being directly on the River. The land underneath this “Signature” bridge, with it’s vast empty plazas and unprogrammed public spaces, will be just as or more worthless and will likely become the biggest homeless encampment in North America. The new Governor should declare this an urban emergency and fire every single person who had any role in its development. smarter highways less traffic ? Once it is done, they’ll have to figure out something else in 10 years when the traffic doubles for this round of new highways. Triple deck then ?? cmon man. Flying cars ? lol. Hey Mcfly, I think you’ve been hit on the head too many times by Biff there buddy. You think so Biff? Flying cars are coming. First prototypes have already been tested. Self-Driving cars were also a thing of the future. You think so ? Because Gimenez and Miami leadership are laughing at your post right now while looking at their plans with bus rapid transit for the future. My little children love the idea of flying cars, dinosaurs, and Santa Claus. By then dedicated lanes for smart cars and busses and automated traffic will have overcome stop and go traffic caused by inefficient driving habits of humans.